Find out more about Humber, Coast and Vale sustainability and transformation partnership (STP) including details of its population size, constituent organisations and priorities. start in life and to have the opportunities and support they need to stay healthy and to age well. We are working together to help everyone in the area to “start well, live well and age well”. 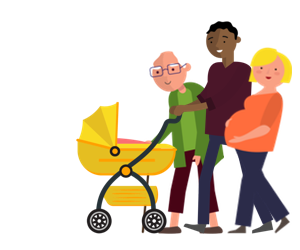 Healthier People – improving the health and life expectancy of local people. Better ‘Out of Hospital’ Care – creating services that are more joined-up so people only go into hospital when it is absolutely necessary and do not stay longer than they need to. Better ‘In Hospital’ Care – making the best use of the resources and workforce across our system to plan and deliver good quality hospital-based services. Better Mental Health Care – improving the care and support that is available for people with mental health problems. Better Cancer Care – helping more people to survive cancer and supporting those living with and beyond cancer. The following organisations are part of Humber, Coast and Vale STP. For individual contact details for these organisations, please see the NHS website.